It’s time for another craft fair/flea market at the Free Space! Let’s come together with our community, support local crafters and vendors, and support the Free Space, too. IF YOU WANT TO SELL STUFF that’s great! Crafts & flea-market-esque stuff is welcome. (If you haven’t been to the Free Space before, check out our website to get a feel for what we do: minnehahafreespace.org). Each vendor will have half of a 6′ table. $15 for upstairs tables & $5-$15 sliding scale for downstairs tables due on the day of the event. Upstairs tables are sliding scale for folx who need to be upstairs due to mobility concerns. Email Oliver at radspacetc@riseup.net for details and to reserve a table. IF YOU WANT TO VOLUNTEER that is super great! You can help set up, clean up, provide child care or whatever you feel like offering. Email Oliver at radspacetc@@riseup.net & let them know what/when/how you wanna help out. The event will be, as always, kid-friendly with childcare provided as needed. The upstairs of the Free Space is wheelchair accessible with an accessible bathroom available upon request. All bathrooms are gender neutral. In this workshop, we’ll delve into the world of Chai-Brewing. We will learn about classic Chai spices and other herbs that can compliment these flavors and support our bodies. We will learn how to brew Chai using a traditional method, and some techniques to make it more simply. This workshop is offered in the Gift Economy. All gifts will go toward my current Healing Justice work: Medicine Making for Standing Rock. people who were here first, and learn from our own indigenous roots. mine, so the heck with them). then we don’t have a post-Columbian future. Island Multiversity, Hamline University, and has taught dozens of EXCO classes over the years on indigenous issues. Having someone listen to your problems in a nonjudgmental way and provide support and feedback is an essential human need that often isn’t valued or talked about in this society. therapy can be a great resource, but sometimes it’s not accessible, not the right option, or only a partial solution. this gathering is about talking about what is lacking in our communities in terms of this type of support, identifying what we need, and taking steps to meet some of those needs in a mutually beneficial way. we will have intros, a general discussion, and then maybe pair up and take turns listening to each other for a short or a long time. we may decide to make this a regular event. we will be centering those who have marginalized identities, especially people of color and trans and queer people who show up, and we will ask those with privileged identities to wait until others have spoken to weigh in, and to help create a space where their needs are not at the center. please contact us if you have questions about that or want to talk about any aspect of this. This is the documentary about the Minnehaha Free State, the insurrection by indigenous people and their accomplices that made history in 1998 and inspired the name of the Minnehaha Free Space. 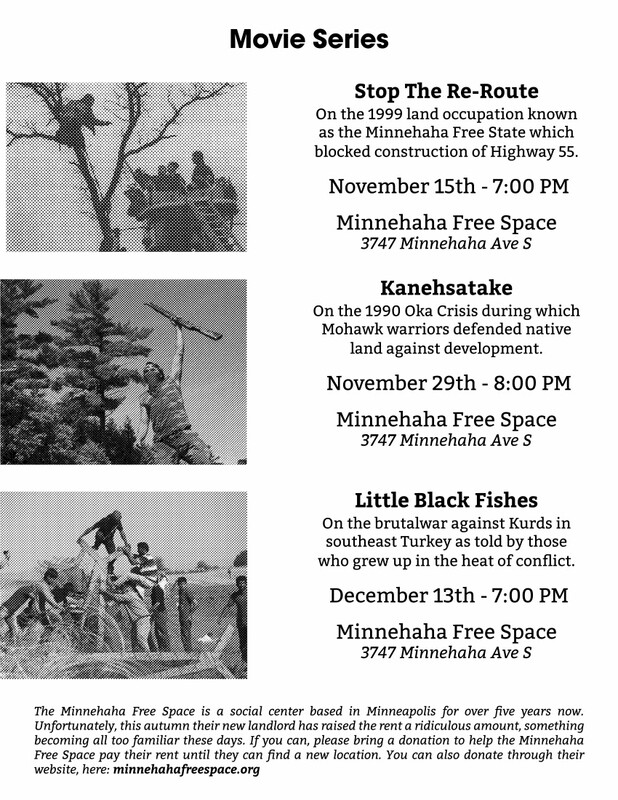 A documentary on the 1998-99 land occupation known as the Minnehaha Free State which blocked construction of Highway 55 through Minnehaha Park. A gathering to support the Free Space in whatever way you can. A videographer will be on site to shoot some footage so we can make a video to support the fundraiser, and it would be great to have some folks do short audio or video interviews, appear in the video, or just share some food, help with stuff around the space, play music, and hang out with kids or adults or both!